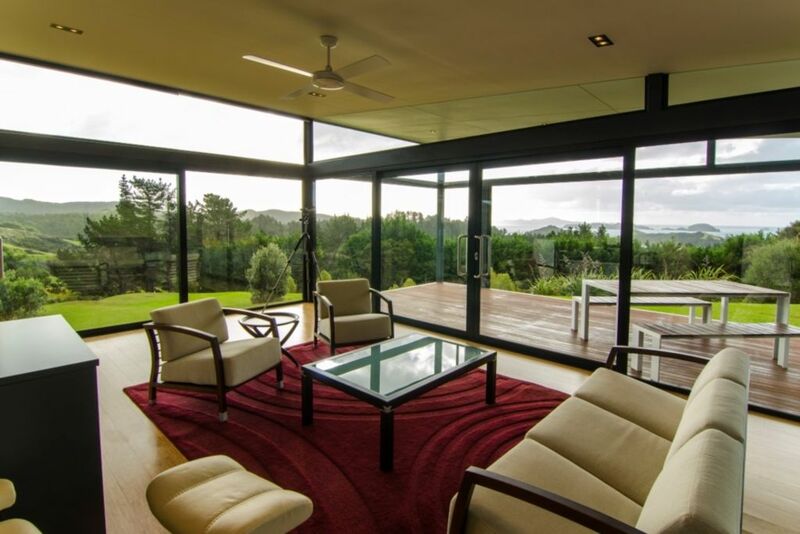 Paroa Retreat is located opposite the Paroa Bay Winery and 10 minutes from Russell or the Opua car ferry. The access road is fully sealed. Built of glass and steel you are surrounded by views. Watch the sunset over the bush clad hills, the yachts sailing in the Bay of Islands or the abundant bird life on the lawn. With 4 hectares of native bush on the property and some easy walking tracks in the area you are sure to appreciate this stunning location. Paroa Retreat combines award winning design in a quiet location with stunning views. Surrounded by nature with all the modern comforts to ensure your stay is enjoyable, relaxing and peaceful. Paroa Retreat is not suitable for children under 10. We are on tank water supply so please conserve water where possible. Gail and Jeff have been fortunate to be able to work and live in the beautiful Bay of Islands. Having both lived in Christchurch for over 30 years we are now both enjoying the relaxed lifestyle available on the Russell Peninsula. Paroa Retreat is a stunning property finished to the highest standards. It is very unique with floor to glass ceilings in every room and a living area surrounded by glass. It is like living outdoors, with all the creature comforts we are used to, all year around. With views out to the ocean an beyond the house is truly stunning. Paroa Retreat is more than a house Paroa Retreat is a work of art. The master ensuite bathroom is finished in white tiles and marble flooring. Towels, facecloths, bathmast, natural soaps, bodywash and shampoo are provided. Take a soak in the bathtub or a quick shower in the large glass enclosure. The Russell peninsula is surrounded by water, with a number of beaches nearby. Check out the sandy beach at Longbeach, the stony beach in Russell or the remote stunning beaches at Elliot Bay. Rolling hills covered in native bush are visible from all rooms in the house. We are close to Russell, but in a quiet location out of town. Watch the colours of the ocean change throughout the day. There are airconditioning units in the living area, the main bedroom and the guest room. You can warm up or cool down as required. All sheets, pillowcases, duvets and extra blankets are provided to ensure a cosy comfortable sleep. A high quality Miele front loading washing machine is available for you to use. A high quality Miele dryer is available to quickly dry your clothes or your towels after enjoying the pool. There is plenty of parking for your vehicle on site with a carport next to the house allowing you all weather dry access. to load or unload yourselves or your provisions. High speed internet with WiFi is available. Towels, handtowels, bathmats and bathrobes are included when you stay. You will be surrounded by glass, with views in all directions from the living area. With good indoor outdoor flow to the outdoor deck and large sliding glass doors makign indoor outdoor living easy. A double dishdrawer is included allowing you to wash all of the dishes easily and quickly so you can get back to relaxing as soon as possible. A large fridge freezer is suitable to keep your holiday food fresh and the drinks cold. A large 900cm gas hob for easy cooking a wide array of your favourite dishes. The oven can be fan forced to bake, roast or grill your favourite meats or vegetables. There is a large barbeque outside to make the most of outdoor living in the summertime. Quickly reheat leftovers for a quick snack. A Nespresso machine allows you to enjoy a kick start to your day with capsules provided. Toast up your favourite bread using our two slice toaster. We supply olive oil for cooking, salt and pepper, a selection of herbs and spices, aluminum foil, gladwrap and baking paper. A selection of teas, sugar and coffee are also included. Paroa Retreat is fully equipped with glassware, cutlery, crockery and a wide array of high quality cooking tools and serving dishes. A modern designer kitchen with granite benchtops and a walk in pantry. Plenty of drawers for storage and integrated waste bins. The dining area is included in the main living area with stunning views in all directions. You can also eat you meals on the covered deck at the front of the house. There are two televisions with one in the lounge and the other in the third bedroom. Both have Freeview local television and Netflix and Lightbox TV and Movies on demand. With Sonos wireless music players throughout the house you can listen to any music you want, in any room you want. A selection of NZ Made movies are available as well as films about New Zealand and some of its attractions. There are an odd selection of books available to help you fill in some time while you relax. You are surrounded by lawns and lots of trees with 4 hectares of bush on our land and plenty more on our neighbour's properties. There is plenty of birdlife to watch on the lawn. A large covered deck with stairs down into a sunken entertainment area make sure you can make the most of our fabulous summer climate. A Vortex Hydrozone Pool and Spa are available out the front of the house, so you can cool off or warm up. We enjoy sitting in the spa gazing at the night sky. Amazing views and location. This is a 5 star property! The house is amazing, just like the photos. The winery only 200 metres away is awesome but you will need to book ahead. The house is impeccably clean and has lots of little extras in the pantry. The amazing views will leave you breathless. What a beautiful house! Loved the location and the view. So very comfortable, quiet and relaxing. Minor issues: the afternoon sun can make it warm inside, but the full length blinds help, along with opening the windows; and the oven didn't work, we had to use the BBQ instead. Stunning property in a beautiful, peaceful location. Stunning property in a beautiful, peaceful location. Very easy to relax and get away from city life for a few days. This property was absolutely stunning and spotlessly clean. This property was absolutely stunning and spotlessly clean. It was magical to sit in the living room and look out over the bay and countryside. Attention was paid to every detail from the gift of chocolates, champagne, to bath robes and beautiful bath products. The kitchen was stocked with everything imaginable including an nespresso machine and coffee. It was also enjoyable to check out the winery located right across the road. This is a beautiful place to stay ?? Checkout the historic township of Russell, wander the streets, walk the beaches or enjoy a meal as you watch the sun go down. If you feel adventurous turn left at the bottom of Paroa Bay Road and go for a walk in the Russell Forest or on beach at Elliot Bay.